do you use anything "unusual" around the house in your quilting? Thread: do you use anything "unusual" around the house in your quilting? My one quilt group is meeting in a couple of weeks and the topic of the meeting is "shortcuts"! I haven't been able to do much sewing the last couple of months due to BOTH my parents either in the hospital or in a nursing home. Right now Mom is in a nursing home for rehabilitation and Dad is in another nursing home due to Alzheimers. so enough about why I haven't been sewing! I thought instead of showing a shortcut it would be kinda fun to see some things you can use around the house for quilting/sewing that you might not think could be used. Any one have something they use? Thanks! Different size cups and plates for round applique or for scallops on the edge of a border. I use a small plastic paintbrush to clean down inside my machine. Works better than the brush it came with. I have two rails with from Ikea that are supposed to be for hanging kitchen implements mounted above my cutting table - top row is for scissors and rotary cutters, bottom row is for small rulers. I have used a phillips (sp) screwdriver as a point turner. I use a long pipe cleaner to remove any dust or fluff from my machine. Much more pliable than a brush and can get right down into the machine. My mechanic has said on several occasions that my machines are the cleanest he's ever seen. He has told me I need only have them serviced every 2 years instead of every 12 months. A large carpenters T square for cutting long lengths of fabric - mine has a "guard" on the cutting edge too! Not a shortcut but I use an old prescription bottle to put my bent/broken pins and needles in. When it is full just screw the lid on tight and toss. No need to worry a that someone will get hurt on them. When I toss the rotary cutter blades I seal them in mailing tape for safety as well. I keep a roll of blue painter's tape handy. I wrap it around my hand a few times, sticky side out, and stick it in a convenient spot on my sewing machine cabinet. All my thread ends get touched to this thread catcher. When it gets full, I throw it out and make another circle of painter's tape to replace it. I use a large carpenter's T (purchased from a big box hardware store) to square my quilts after they are one. I have a piggy bank that collects any discarded sharps! Bonus ... it doubles as a "weight " when one is needed. I use an old frosting can for a mini trash can on my sewing table. I use wooden skewers (bought at WM or dollar stores in large pkg) as stilleto or point turner. Usually cut them in half and smooth ends with emery board. Emery board makes quick pencil sharpener. Have old permanent rollers(with stretch closures) to roll strips of scraps. They close and keep strips neat. Hanging jewelry organizer next to machine for thread or other needs. DH's diabetic test strips come in flip-top containers that are just right for used needles. Put damaged rotary blades in his 'sharps container' for syringes. I use the "free orange peeler" from Tupperware to turn corners without worrying about "poking through". Blue painters tape is the best thing for temporary holding. I use blue painters tape on my rulers to help me remember which line I am using as a guide , like when using my 5 x 24 ruler for cutting long 2 1/2 inch strips, I just put the edge of the tape along the 2 1/2 inch line on the underside of my ruler. it makes it easier to find the correct line each time plus the tape acts like a non skid and keeps my ruler from shifting while cutting ! Double bonus ! Large clamps (found in the hardware section) for holding down rulers to the cutting table, especially the 4 by 36" ruler. One clamp is enough to hold the ruler at the far end while I hold down the end closest to me, for example. Those foam sanding sponges are Wonderful to remove threads and lint from my work. (I keep one in the bedroom to use as a lint brush too). I picked mine up at the dollar store, hardware aisle. I do the same with broken needles and bent pins. This is a good thing. 1st -I use a ball winder to store my binding until ready for use. Just slip an empty toilet tissue cardboard over the winder and holding the binding gently in my hand, crank away and my bind is neatly wound around the cardboard. I use a tall Planters mixed nut can as my trash can for threads and unusable scraps next to my machine. I put the plastic lid on the bottom of the can so it doesn't slide on my table. And my husband gave me one of his small heavy rubber mallets to use to pound fabric where numerous pieces of fabric are seamed together, really reduces the bulk so the block will lay flat. Lot of things mentioned here I use and some good new ideas for me, too. I had a big bag of smooth decorative rocks given to me many years ago. I have them in different sized plastic containers (so I can stack them inside one another when not using them) and when I have a big piece of fabric to cut, I use these buckets of rocks as weights to help secure the fabric while I smooth and straighten it. Chopstick from Chinese restaurants work great for getting into points after turning. They are free and usually decorative, to boot! I loop a plastic grocery bag on the 2nd thread holder of my machine to hold my loose threads and paper since I am paper piecing right now. I buy sugarless chewing gum in a small plastic container. Don't much care for chewing gum but the container is a perfect size for rotary cutter blades. The top snaps closed and the blades are safely contained. When it is full I just throw it in the trash. I have to try some of the repurposing hints! I use old tins to put my used blades in for recycling, pill bottles for old needles, paintbrushes to clean my sewing machine. I found a utensil holder from a dishwasher and store my pens, scissors, rotary cutters, seam rippers, ruler,etc all on my cutting area. 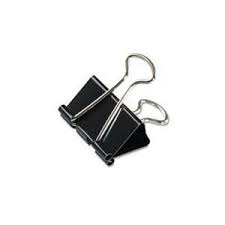 I use binder clips like these to hold borders while I handsew. I don't get tangled like I do with safety pins and they're a heckuva lot cheaper than the ones marketed to quilters! I use a lazy susan and a small rotary mat to cut small pieces. An artist's paint brush to clean out lint.